A group of passionate and intelligent young Victorians from the Mildura YMCA Youth Parliament have debated their way to victory in support of the Home Stretch reform, seeking to provide young people in state care the option to remain in care until 21 years. The Bill was overwhelmingly passed (48 to 11) which now means it will be passed to the relevant government minister, the Minister for Families and Children Jenny Mikakos for consideration. Members of the team argued that no young person living in out-of-home care should have to worry about their future prospects and that providing the option of out-of-home care to 21 would allow young people in care to receive the supports they need to achieve a better future. “The young people taking part in Youth Parliament are our future leaders, it’s very encouraging to see them so passionately advocating for the extension of out-of-home care to the age of 21,” said Home Stretch Chair, Paul McDonald. Mildura Youth Parliament Media Leader Hannah Jackson said the team had been working really hard ahead of the debate. 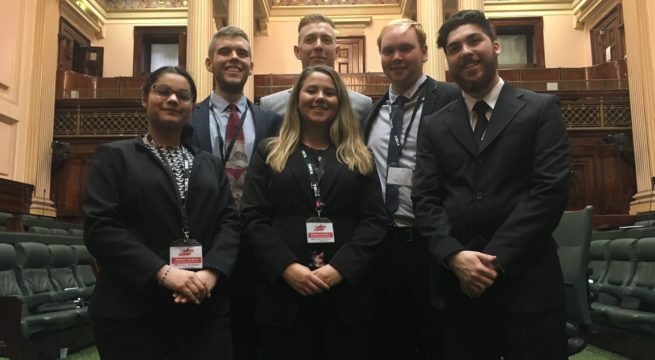 The YMCA Victoria Youth Parliament gives young people aged 16 to 25 the opportunity to draft, debate and vote on bills which provides a glimpse to issues which are important for young Victorians. Home Stretch is calling on Premier Daniel Andrews in the forthcoming Victorian State Election to commit to extending care to 21 as part of Labor’s election platform. Paul McDonald, Victorian Co-Chair Deb Tsorbaris and Mildura Youth Parliament Representative Hannah Jackson are available for comment.